It's my 28th birthday! So happy birthday to me! I already received a great present from you, my blog readers: My 20th follower! Maybe with your help I can make it to 28 by the end of today???? To celebrate, I am going out to dinner tonight with my husband, to my favorite NYC vegan restaurant. I will tell you all about it tomorrow. 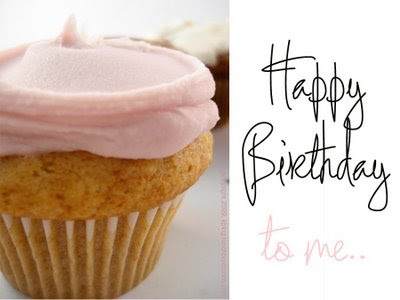 ...oh and the cupcake in the photo is from a great LES NYC vegan bakery called babycakes. For my birthday, I will do a special review of a few different yummy cakes later today! Check back. -This is my third birthday living in NYC. Last year I went to famous all-vegan restaurant, Candle 79. It was delicious. All the awards are well-deserved. -Two years ago I went Craft. Tom Colicchio's NYC restaurant. Best mushrooms I've ever had. Yum. -My mom always writes me the same cute note every birthday: "Happy Birthday to our beautiful daughter -- Hope you have a great day and a happy dinner tonight. You were born at 12:30 PM. There was a rainbow in the sky in the morning as we drove over the hill to the hospital." -My birthday also coincides with my half wedding anniversary. I was married on July 30th, 2006 in Miami. -My birthday usually falls on or very close to the NFL Superbowl. -My favorite cake flavors? German Chocolate, Strawberry Shortcake and Carrot Cake. Thanks again for reading my blog, and allowing me to share my Healthy. Happy. Life with you.